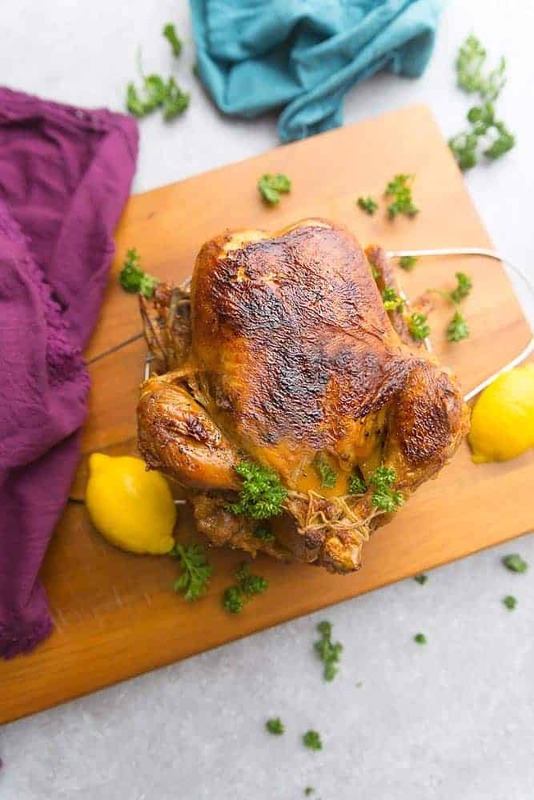 Instant Pot Whole Chicken – Rotisserie Style – perfectly tender, juicy, roasted chicken you can make easily at home in about 45 minutes using your Instant Pot pressure cooker. Best of all, includes instructions for using thawed or frozen chicken, and an oven. What’s your idea of a perfect Sunday meal? It’s hard to choose just one but a roasted whole chicken – rotisserie style – comes pretty close. My family loves that perfectly crispy skin and tender and juicy meat. You know what? 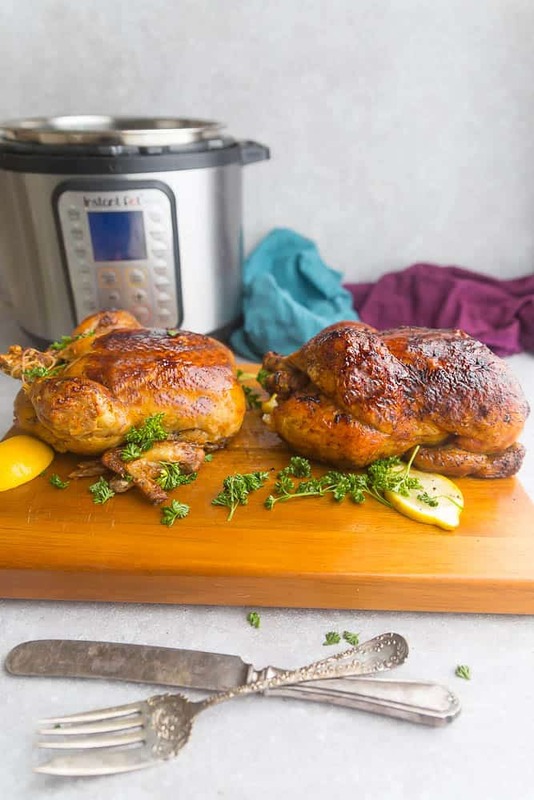 Making your own whole rotisserie style chicken at home couldn’t be easier. I love how much healthier and tastier it is to make your own rotisserie chicken at home. So much better than the ones you pick up from the grocery store. And the best part? You can store any remaining leftovers in the fridge or freezer (up to 3 months) to use in tacos, sandwiches, casseroles, soups and more to enjoy throughout the week. CAN YOU MAKE CHICKEN BROTH WITH THE LEFTOVER BONES? We make a whole chicken at least once a week just so we can use the leftover carcass and bones for a big batch of nourishing bone broth or chicken stock. 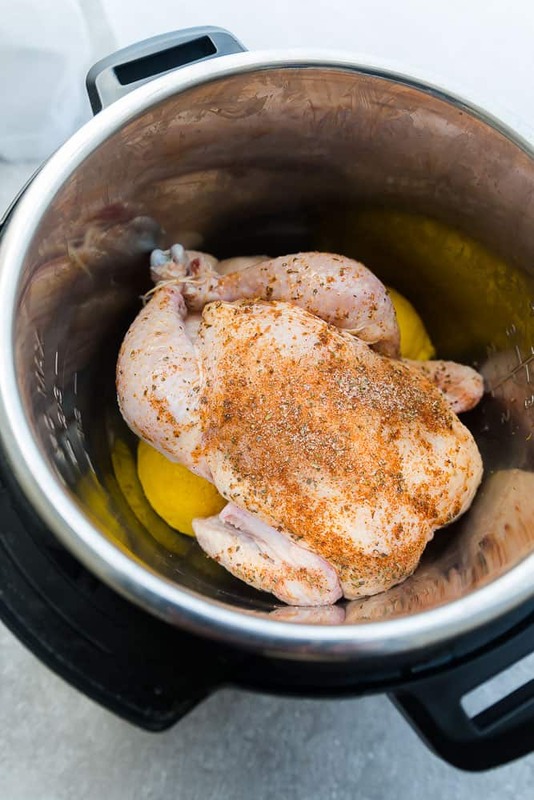 HOW LONG DOES IT TAKE TO COOK A WHOLE CHICKEN IN THE INSTANT POT? And my new favorite way to make a roasted chicken is definitely in the Instant Pot. Now instead of 1 hour and 30 minutes, the roasted chicken cooks up in about 45 minutes from start to finish. And you know how chicken breasts are usually dry? Making chicken breasts in the Instant Pot, ensures that the breasts cook up tender and juicy. 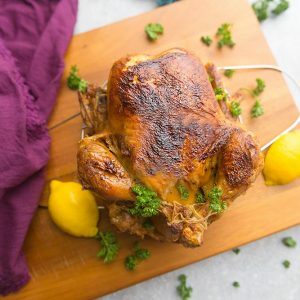 CAN I MAKE THE CHICKEN IN THE OVEN IF I DON’T HAVE AN INSTANT POT? Yes, of course! As you can see, I made two whole chickens – one in the oven and one in the Instant Pot to compare the difference. What’s amazing is the Instant Pot can even cook the whole chicken from frozen in about 60 minutes. And the meat cooks up super soft, tender, juicy and fall of the bone delicious! Serious game changer! 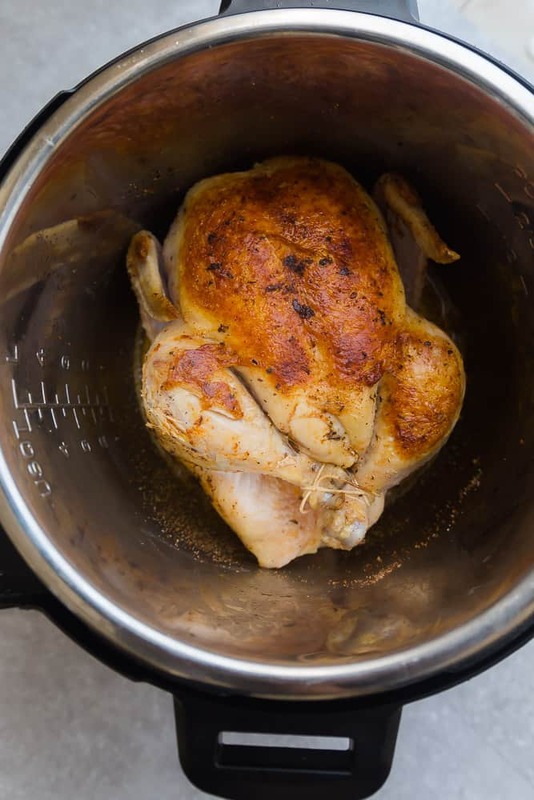 HOW DO YOU MAKE A WHOLE CHICKEN IN THE INSTANT POT? First, you’re going to loosen the skin underneath and rub the entire chicken with olive oil followed by the seasonings. This ensures that your chicken is seasoned properly with flavor and not bland. WHAT SEASONINGS DO YOU USE? For the seasonings, I like to use salt, black pepper, smoked paprika, Greek seasoning, Italian seasoning, garlic powder and onion powder. Feel free to use any combination of herbs and spices you like! HOW CAN YOU KEEP CHICKEN JUICY AND MOIST? You can add a lemon, some garlic and an onion in the cavity the chicken. This adds flavor to the the chicken and helps the chicken stay juicy and moist inside. This is totally optional so feel free to skip this step if you prefer. HOW DO I GET CRISPY CRUST ON THE CHICKEN? Turn the Instant Pot to saute and heat up the remainder of the olive oil. Carefully add the chicken – breast side down and allow to sear/brown for about 5-6 minutes, or until brown. Using tongs and a spatula, carefully flip the chicken over to the other side. Cook undisturbed for another 5 minutes until brown. Rub chicken with remaining seasoning and place on top of the trivet, breast side up. WHAT ARE THE COOK TIMES FOR DIFFERENT SIZES OF CHICKEN? Press MANUAL or PRESSURE COOK for 24 minutes for a 4 lb chicken. (For a every pound of chicken, multiply that by 6 and you’ll get the time. E.g. 3lb chicken – 18 minutes & 5 lb – 30 minutes. Once the chicken is done and the timer beeps, allow the pressure to release naturally – about 15-20 minutes. 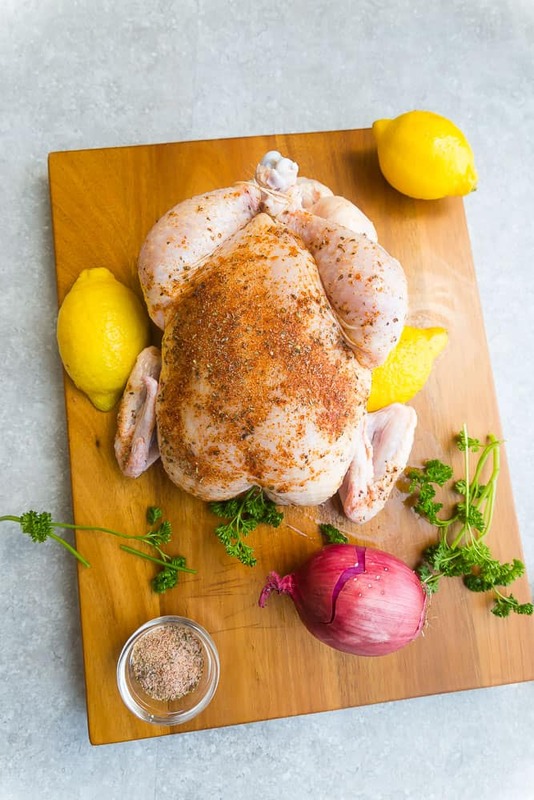 Transfer chicken to a large platter or a cutting board. Discard onion and lemon. 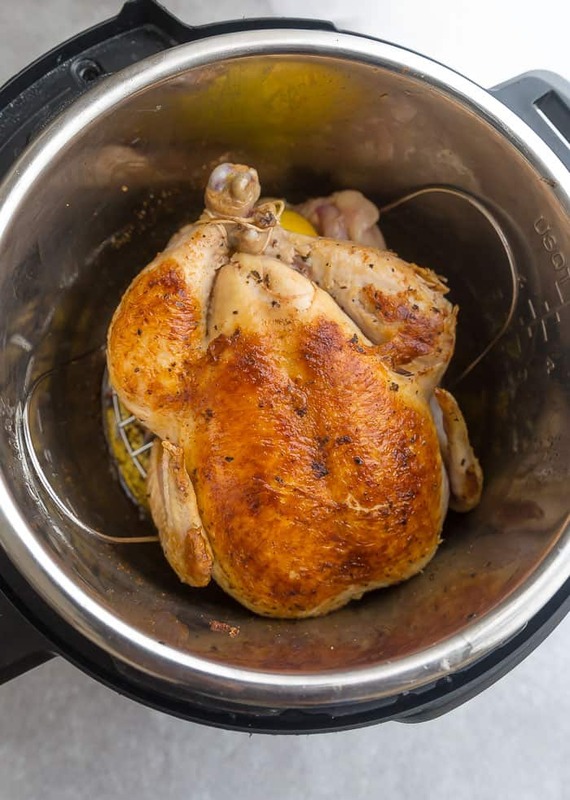 CAN YOU COOK A WHOLE CHICKEN FROM FROZEN IN AN INSTANT POT? This Instant Pot Whole Chicken cooks up perfectly tender and juicy. Slice or shred up the breasts and divide the legs and wings to serve with your favorite sides. 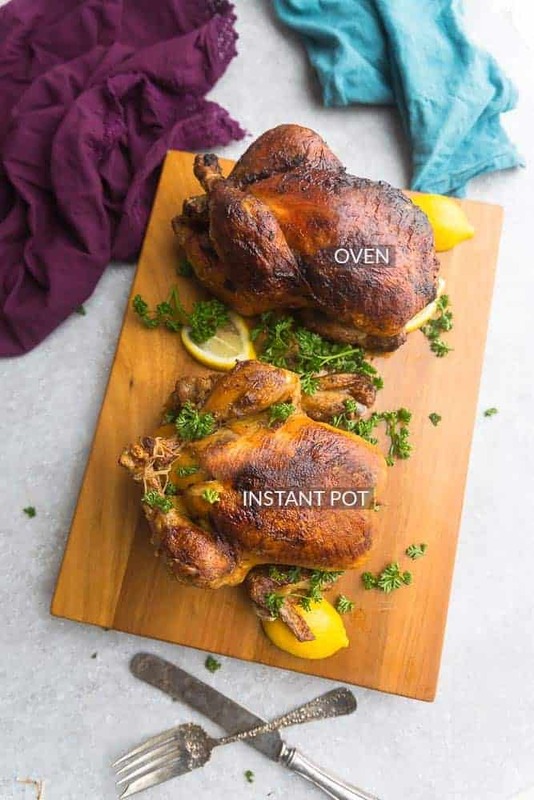 WHAT CAN YOU SERVE WITH INSTANT POT WHOLE CHICKEN? A roasted Instant Pot whole chicken goes great with some garlic mashed potatoes, wedges or sweet potato fries. And to keep this meal low carb, keto and paleo friendly, serve with some roasted asparagus, broccoli, cauliflower or a delicious salad. 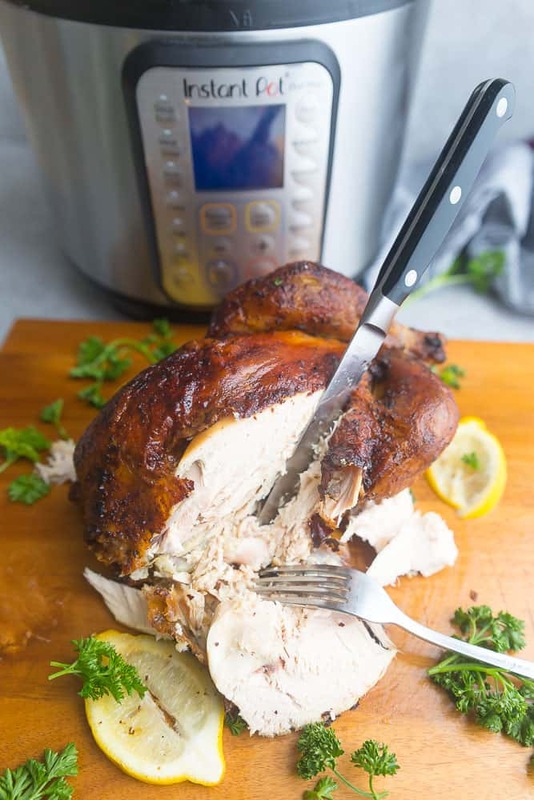 Instant Pot Whole Chicken - Rotisserie Style - perfectly tender, juicy, rotisserie chicken you can make easily at home using your Instant Pot pressure cooker. 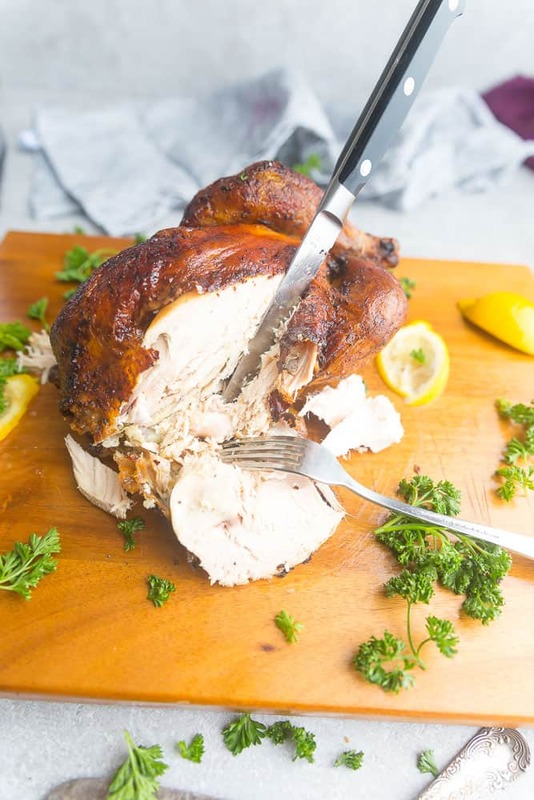 Best of all, you can have a simple low carb keto roasted chicken dinner in about 45 minutes. In a small bowl, combine the salt, pepper, Greek seasoning, Italian seasoning, paprika, garlic, and onion powder. Gently loosen the skin from the chicken breast with your hands lifting and separating the meat. Rub 1 tablespoon of olive oil followed by a third (1/3) of the seasonings under the skin using your hands and fingers. Next, rub another tablespoon of olive oil and the rest of the seasonings over entire chicken and inside the body cavity. Optional: place the onion, garlic cloves and lemon inside the cavity of the chicken. This helps to seal in the moisture and add flavor. Press the SAUTE button HIGH. When the word "Hot" appears, swirl in 1 tablespoon olive oil. Place the chicken - breast side down, in pot and sear for 5-7 minutes, or until a golden brown. Using tongs and a spatula, flip the chicken over and sear for another 5 minutes, or until brown. Remove chicken and place on a large platter. Place a trivet (the one that came with the Instant Pot or use another) inside the inner pot of the Instant Pot. Pour chicken stock or broth in pot. Place trivet on top of the chicken broth then lay chicken on top of trivet, breast side up. Cover and lock lid. Turn the valve to SEALING. Press the MANUAL or HIGH PRESSURE button and set to 24 minutes if your chicken is four pounds. If it's smaller or larger, calculate how much time it should cook by multiplying the number of pounds by 6 minutes. So, a 3 pound chicken would be 18 minutes and a five pound chicken would be 30. For a FROZEN WHOLE CHICKEN - set to 42 minutes ON HIGH for a 4 lb chicken. Allow the Instant Pot to come to pressure (this may take about 10-15 minutes). 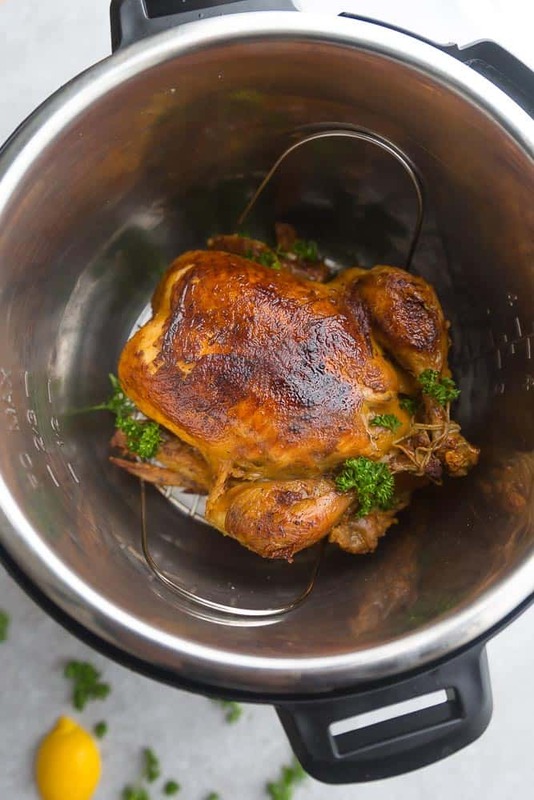 Once the 24 minutes is up and the Instant Pot beeps indicating the chicken is done, allow to naturally release for at least 15 minutes and then quick release for any extra pressure. Open lid and transfer chicken to a platter or a large cutting board. Optional: Broil in the oven for 4-5 minutes to crisp up the skin. Let chicken cool for 5-10 minutes. Slice or shred and serve with your favorite sides. Place seasoned chicken on an oven roasting pan and cook for approximately 30 minutes. Cover loosely with aluminum foil (to prevent too much browning) and cook for an additional 40-50 minutes or until temperature reads 165 F.
Remove roasting pan. Let chicken cool for 5-10 minutes. Slice or shred and serve with your favorite sides. Save your bones in a freezer bag until you're ready and you can make Chicken or bone broth. Delicious! I lost some of the skin when turning over the chicken to sear the second side, but it was still good and so much less time and trouble than hovering near the oven (especially in mid summer)! I Plan to try this, but I’m going to cook in the pot first, then do a quick broil at the end so I don’t lose skin. It’s hard to sear a whole chicken in a pot. I didnt have greek seasoning but i had all the Herbs necessAry, so i grinded them tOgether in a coffee grinder and presto—greek seasoning. I am pretty sure i butchered the chickeN when loosening the skin from the meat…but seasOning On the inside of the skin, made a ton of difference. I also stuffed it with the onion lemon and garlic which was awesome. At the last minute i realized i had no chicken brOth, so i just used the giblets from the chicken, water, salt and the remainDer if the onion i couldnt stuff in the chicken, some carrots and celery and let that all boil and reduce while i prepped the chicken. So it all worked out even though i was a hot mess throughout the entire process. And this waS the first thing i cooked with an instant pot, and it turned out well. I just made this and it was delicious. The chicken was extremely tender and had an excellent flavor. I followed the directions other than I browned it in a skillet on the stove top instead of the instant pot as i thought it would be easier to handle. I am looking forward to trying some of your other instant pot recipes….this one is a keeper!! I was a little skeptical about doing a whole chicken but this turned out delicious!! I shredded the dark meat for soup and cut up the breast for supper. I even strained the left over broth, froze it in ice cube trays and will use to when I make soups/sauces. Will probably get 4 meals out of a whole chicken. Your directions were so easy to follow and didn’t have a bunch of “weird” ingredients. This recipe came out amazing. I was wOndering if 2 whOle chickens could fit in an 8qt pot and how that would affect cooking time and liqUid quaniTy. Thank you for the recipe, the family loved it and it’s a keeper. Thank you thank you thank you for this perfectLY delicious and most excellent recipe! If I could give it 10 stars I would. This was delicious, so good! Thank you! i MADE THIS AND IT WAS SO YUMMY! i HAD A 4LB CHICKEN AND CHOPPED UP SOME SWEET POTATOES AND THREW THEM IN THERE..AND WOW…SO GOOD! Such a good chicken recipe!